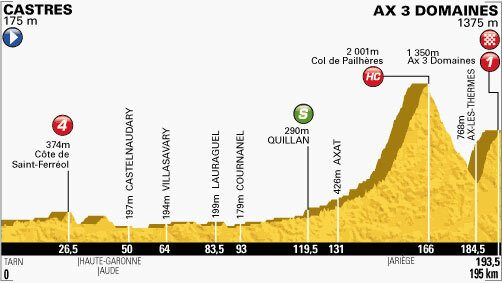 Stage 8: Let The Climbing Begin! One down, two to go– referring to weeks, that is! And some will say the real Tour began today, if of course you equate “real” with the battle for le maillot jaune as intense climbing got underway with stage 8 in the Pyrenees. A suspenseful, spectator-filled climb it was to the high point of Le Tour 2013, Col de Pailheres. Silly me for turning away from the television for a few minutes this morning to get ready for my own 70-mile ride, because before I knew it the leader of the day’s biggest climb was overtaken on the final climb to the finish. In the end, we’re left with another stage winner and another passing of said maillot. Way to go Froome! Chris Froome wins stage 8 and takes yellow!